One of my favorite sources for photographs of interiors is auction catalogues. Often, it is the only public record of a private collection that only a rarified few have had personal access to. This is not exactly the case with the Christie's South Kensington sale of the property of Cotswolds antiques dealer Roger Warner: after all, anyone could come into his shop in Burford and browse - and many did, from Queen Mary to Bruce Chatwin to Robert Kime. Warner's eye was both refined and eclectic and embraced deeply patinated oak furniture, 18th century costume, Victorian hairwork pictures, and even a mummified Egyptian cat! Here are a few of my favorites rooms in his house which was tucked right behind the shop, along with my picks of the sale. A view of the hall. I am crazy for this 18th century English botanical oil painting. Estimate $30,000-$45,0000. I'm really drawn to the primitive quality of delftware. An amassment, like in this cupboard, really packs a punch. I love these. A collection of five French painter papier-mache wig makers' or milliners' marottes, circa 1880. The largest 16" high. $1,500-3,000. Who couldn't use another bookcase? 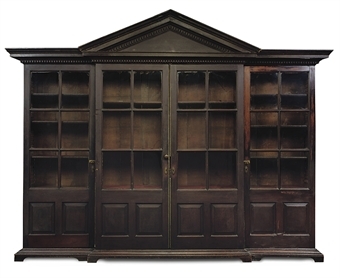 A GEORGE II ARCHITECTURAL BREAKFRONT BOOKCASE CIRCA 1740. Estimate $11,000-$15,000. 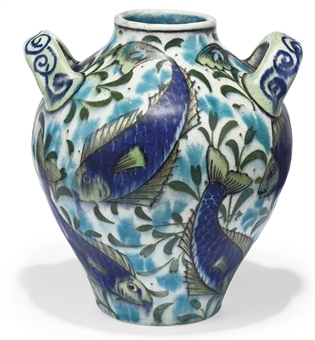 A William de Morgan twin-handled ceramic vase, circa 1890. Height: 7 1/2" Estimate: $3,000 to $4,500. de Morgan's work is a sound investment and his dexterous use of color and pattern reminds me of textiles - another obsession of mine! All images from the Christie's South Kensington sale catalogue of The Roger Warner Collection, 20-21 January 2009.